Robert Thompson has been at the forefront of solo bassoon playing for almost 50 years. Gathered here, in a 4-CD set, are recordings of concerto and chamber works which mark important stages in the development of the bassoon. Familiar repertoire by Vivaldi and Mozart is coupled with more esoteric compositions by Jacob, Downey and Jurriaan Andriessen. The Bax Threnody and Scherzo receives its first recording with full string accompaniment. 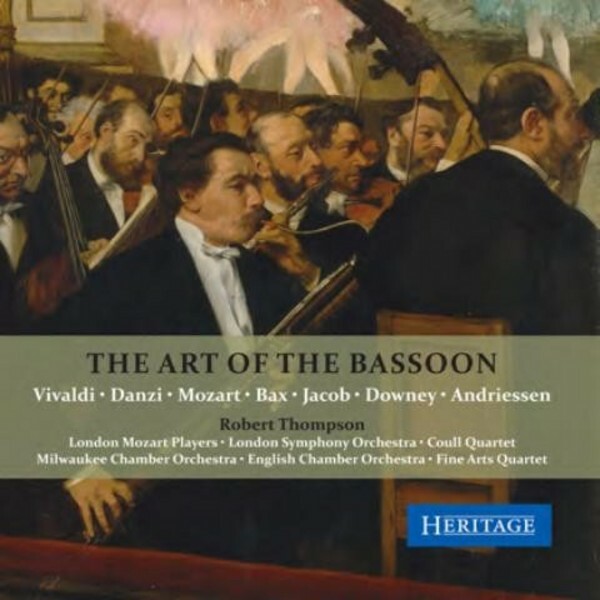 This 4-CD set supplements Thompson�s recent highly-praised performance of Panufnik�s Bassoon Concerto, also on Heritage (HTGCD266), while making a significant addition to the recorded catalogue of major works written for this often underrated instrument. The recordings appear by kind permission of Chandos and CRD. Robert Thompson has enjoyed a career unique amongst bassoonists since his highly praised debut recital at Carnegie Recital Hall. He has appeared and recorded with many orchestras and chamber groups, including the BBC Symphony Orchestra, English Chamber Orchestra, London Symphony Orchestra, London Mozart Players, the Coull Quartet and the Fine Arts Quartet. Composer Andrezj Panufnik wrote the Bassoon Concerto for Thompson who then gave highly-praised premieres of it in Milwaukee and London with the composer conducting. He has recorded for Columbia, Chandos, Harmonia Mundi and Conifer. His recording �20th Century Bassoon� was nominated for both a Gramophone Award and the Koussevitsky Prize for 20th Century Music. He teaches at the University of Wisconsin-Milwaukee and gives regular international masterclasses.